Over the past decade and then some, Raleigh, North Carolina, has piled up a litany of placements at the top of livability lists. The city has been called the best place to reside, work, play, start a small business and relocate. The result: Raleigh's population has grown faster than nearly any other major American city in the past decade. And that mostly unchecked growth has led to a less desirable moniker: Sprawleigh. Last year, a report by a group called CEOs for Cities identified Raleigh as one of the worst commuting cities in America. In metro areas with extensive urban sprawl, such as the Tarheel capital, residents might average as much as 240 hours per year in traffic because commuting distances are much longer. Ahead of that negative press, city officials had already embarked an ambitious rezoning called the 2030 Comprehensive Plan for the City of Raleigh. The teeth of the plan is a new development code designed to increase density by catering to a younger working populace that wants to live closer to in-town jobs, as well as catering to aging boomers who also appreciate walkable neighborhoods with dining and shopping options. Raleigh wants to redevelop a number of areas along specific transit corridors that will entice future growth. To get there quickly, the new code will be half the size of the previous one, easier to understand, favorable to mixed use projects and with an expedited approval process, according to Mitch Silver, Raleigh's chief of Planning and Economic Development. "We wanted to have a conversation on what is a 21st century city. Raleigh is a city coming of age, kind of in an adolescent period. We asked, When we grew up, did we want to be like Atlanta or did we want to be like another city?" Over the past three decades, Raleigh was like a lot of places in the south and west that were eager to grow and did so without much forethought. Even in cities that had plans, such as Raleigh, the speed of expansion proved overwhelming. Millions of Americans were relocating in a gold rush search for better jobs and warmer climes. With space to stretch, not having to build up meant building out. From 1950 to 2000, Raleigh's land use grew 1670%, 3.5 times faster than the population, which increased by 480% to about 400,000. 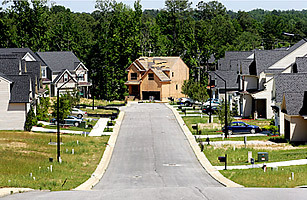 And that has created a massive problem; in a national 2002 sprawl study by community advocacy organization Smart Growth America, Raleigh was ranked third worst, based on measures of density, mixed use, centeredness, and road connectivity. Sprawl isn't new. It began with the advent of the automobile that allow homebuilders to turn rural tracts into widely dispersed suburban neighborhoods. Renowned city planner Earle Draper, who coincidentally designed the historic upper class Hayes Barton neighborhood in northwest Raleigh, described the problem: "Perhaps diffusion is too kind of a word," he mused, but he later got to the point. "In bursting its bounds, the city actually sprawled and made the countryside ugly," said. He added that the outward growth was "uneconomic of services and doubtful social value." Silver agrees. "First and foremost it's the cost. As you start to expand your network, there's more cost for infrastructure, there's more cost to maintain it, and in many cases you don't get the highest yield per acre in terms of your tax base." On top of that, an Urban Land Institute study from 2009 claims most traffic, 80%-to-85% of it, is created not by work commutes but by the need to drive for daily errands such as shopping, ferrying kids, dining out and so on. "There's added travel time and issues to air quality because you produce more in terms of emissions and greenhouse gases," said Silver. "There are quality of life issues and real tangible economic issues." See pictures of how cities are powered.